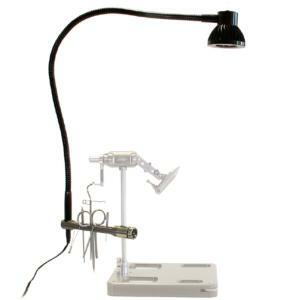 , this light is extremely versatile, having a long flexible neck giving you maximum freedom around the vice head. The tool rack has several diameters for all the tools needed for Fly assembly. It also comes with dual voltage for worldwide use. - 110 to 230 volts (EU/US standard) dual voltage for worldwide use. Marc Petitjean Fly Tying products since 1990 have developed a small, yet comprehensive range of fly fishing products for the modern angler. including this Marc Petitjean Day Light With Tool Rack.